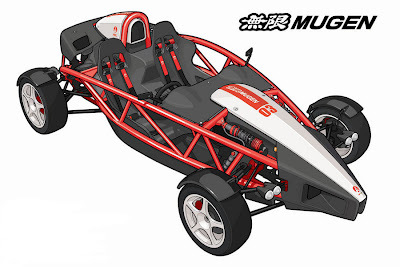 日本自動車デザインコーナー 「Japanese Car Design Corner」: Ariel Atom tuned by Mugen is coming!!! Ariel's super fast Atom is well known, but now it's coming tuned by Mugen (無限)!!! The Mugen version, which is coming out to celebrate the model's 10th anniversary, is going to be powered by a Mugen-tuned Honda K20Z Type R engine, an engine that has been used in regular Atoms since 2007. Power will be increased by 25 hp and total output will be 270 hp! Only 10 cars will be built, each featuring a special livery and a numbered plate signed by the Mugen and Ariel technicians responsible for its build. The Ariel Atom Mugen will be shown at the Autosport show in January, when full prices and final spec will be announced.